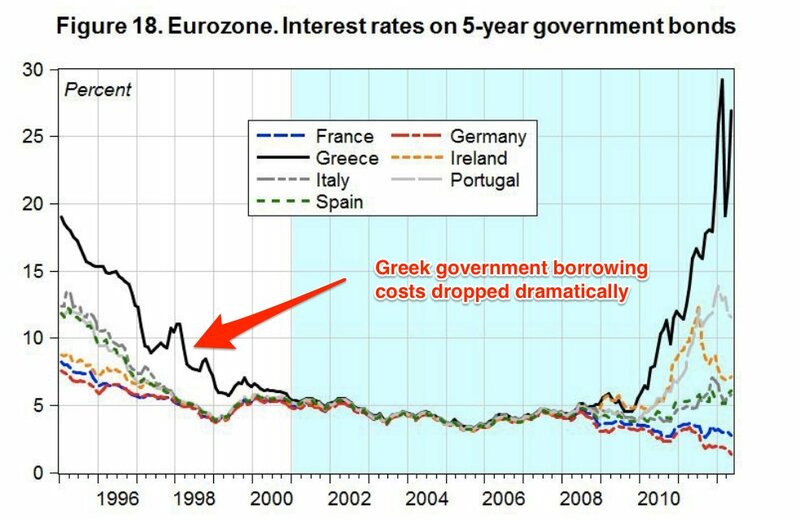 THE STORY OF the Greek crisis is often painted as either one of the reckless borrower gambling with other people’s money, or the victim of an inflexible European project that squeezes its weaker members for the benefit of the stronger. There may be some truth to both of these narratives, but to get a fuller understanding of the causes of Greece’s current problems you have to look further back at the country’s own history. What you find is a sorry tale of nihilistic political populism, a wilful suspension of disbelief by international partners and a series of unfortunate accidents that helped turn a promising post-war recovery into a nightmare for its citizens. And it all started with the price of oil. After the World War II, Greece underwent an ‘economic miracle’. 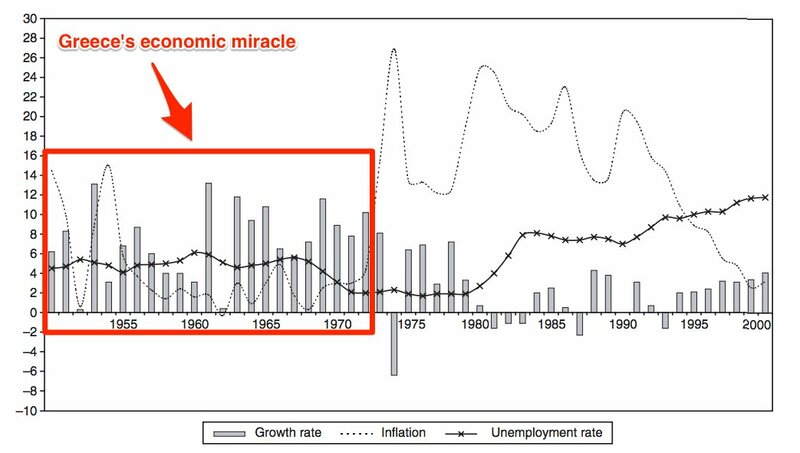 GDP growth averaged 7% per year between 1950 to 1973, second only to Japan. 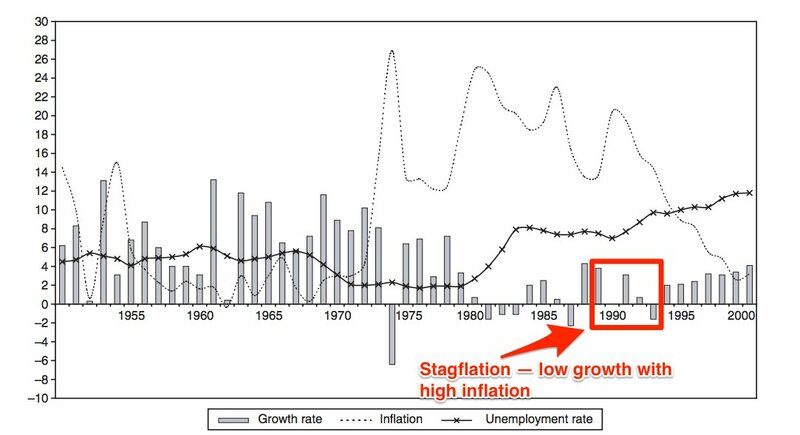 The period also saw low unemployment and moderate inflation. Moreover, the living standards for Greek citizens also improved hugely. In the 1960s and 1970s, GDP per capita increased by 210%, or an average of 6.1% per year, as workers became much better off. Industrial production grew rapidly, as did Greece’s tourism and services industries on the back of financial support from the US under the Marshall Plan. State Department strategists have now come around to the point a good many ‘visionaries’ have been urging all along, that one way of combating Communism is to give western Europe a full dinner pail. 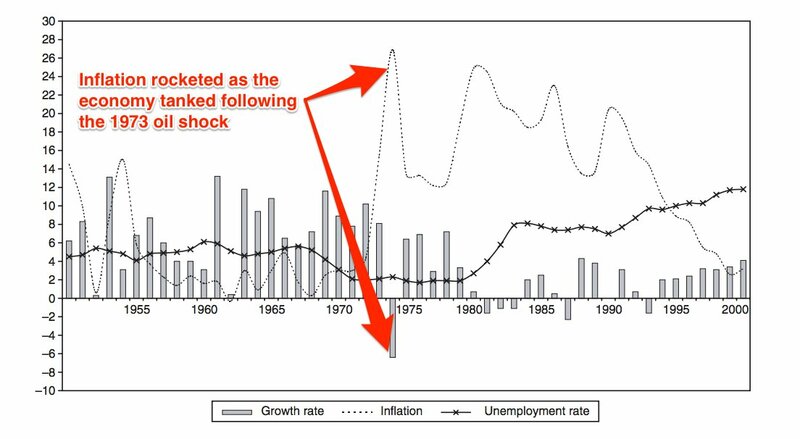 But the 1973-74 oil price shock changed everything. Sharp rises in the oil price stopped Greece’s economy dead in its tracks. In 1974 the country suffered a sharp recession while inflation, which hadn’t been above 5% since the mid-1950s, suddenly leapt to over 25%. It remained above 10% for over two decades. The stabilisation policies of Constantine Karamanlis’ newly formed New Democracy government, which had won the country’s first democratic elections following the collapse of the ruling military junta, helped soften the blow of the oil price shock but failed to tame inflation. And the second oil price shock of 1979-1981 was a hammer blow to both the economy and the electoral chances of New Democracy. The government lost power to the populist left-wing Pan-Hellenic Socialist Movement (PASOK) party in 1981. 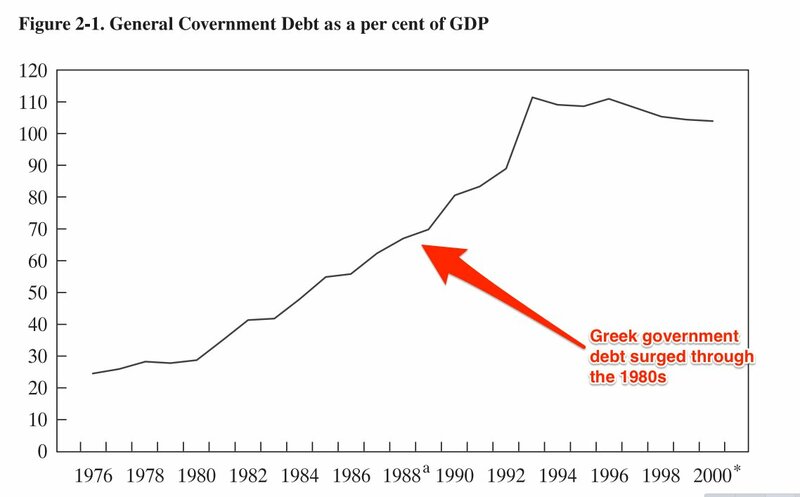 Shortly after PASOK took power, the country’s debt-to-GDP ratio began to balloon as the government borrowed heavily to finance its populist programme of state spending. 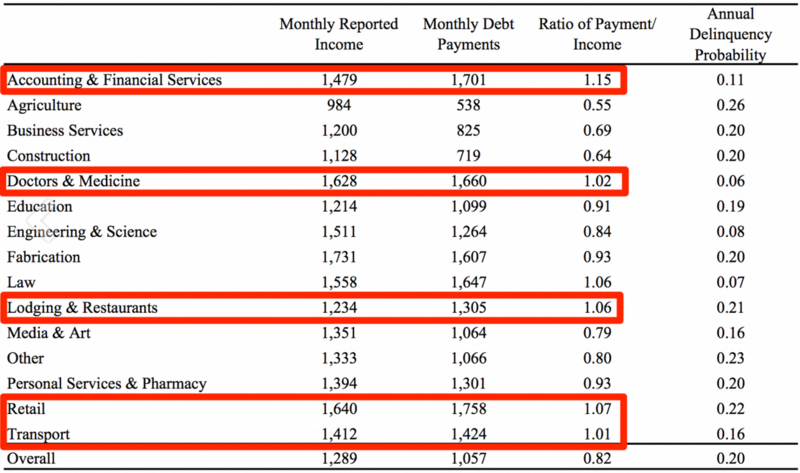 The spending boom was primarily driven by substantial wage and pension increases for civil servants (especially in the early 1980s) and expansions in public sector employment financed by the issuance of government debt, which banks were required to buy at negative nominal interest rates set by the state. 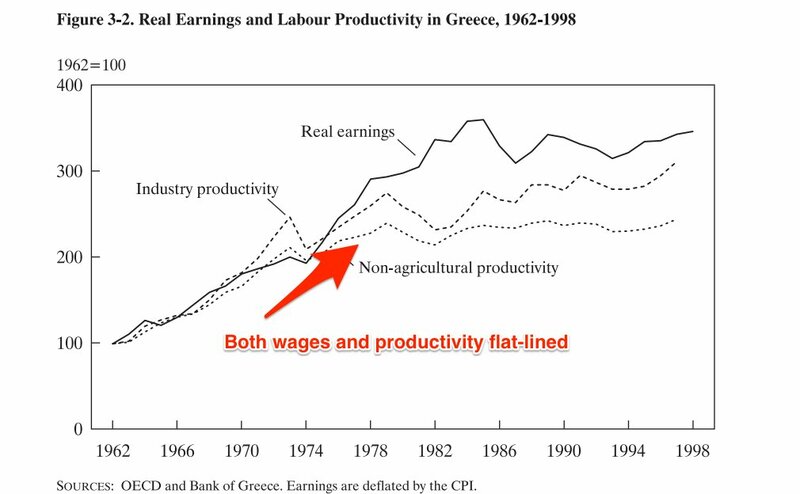 These policies coincided with a collapse of worker productivity growth. Although PASOK was re-elected in 1985, its clientelistic policies of rewarding friends and supporters would come back to bite it in the “Koskotas scandal”. Prominent Greek-American businessman George Koskotas, the owner of the Bank of Crete, fled the country amid accusations of embezzling €220 million. Koskotas alleged that he had paid off senior figures in the Greek government — including Prime Minister Papandreou (a charge that the High Court later cleared him of) — prompting widespread political unrest. In the wake of the scandal, PASOK lost out to New Democracy in the 1989 election and a succession of short-lived coalition governments attempted to bring in unpopular ‘shock-therapy’ reforms in an effort to get the economy back on track. What did work, however, was the signing of the Maastricht Treaty in February, 1992. The treaty required countries to stick to limits on government deficit and debt levels in order to participate in the Economic and Monetary Union (EMU). 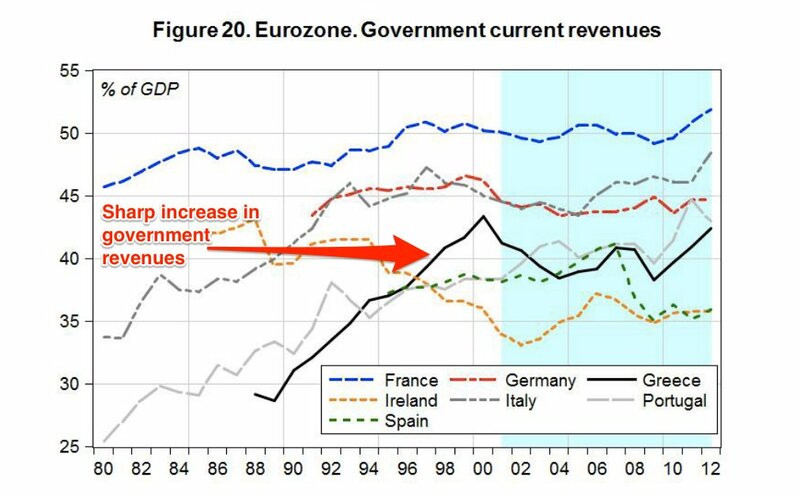 For Greece, this meant a record-breaking increase in government revenues. The sharp increase in revenues combined with falling government borrowing costs helped stabilise the situation for the years leading up to the financial crisis. … but it failed to fundamentally shift the appeal of buying support. The Greek government took advantage of the fall in its interest payments to increase other spending, rather than reducing its debt. Meanwhile, the perception that the government handed out favours selectively and departments of state had become corrupt drove distrust in the system. It manifested itself as widespread tax evasion, a seemingly endemic problem among Greece’s professional class. And as such the state was left vulnerable to a sudden reversal in fortunes — as we saw with the global financial crisis. The result? A sovereign debt crisis. This legacy has left a major headache for the current Greek government as it struggles to unwind the damage of the past while providing hope for the future to the Greek people. 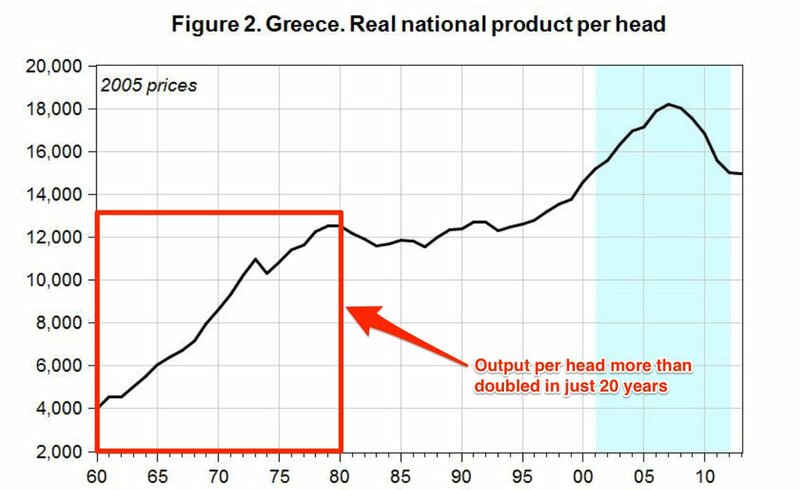 Email “All of Greece's problems can be traced back to the 1970s ”. Feedback on “All of Greece's problems can be traced back to the 1970s ”.